nine × = forty five Required Please enter the correct value. The Dow Jones Industrial Average gained just 34 points on a day when the index was mostly flat, leaving many traders to wonder why they even got out of bed today. The markets seemed to be largely in a holding pattern ahead of Friday's critical release of the February unemployment rate. Energy stocks were the most active as optimism for a deal between producer nations has investors expecting that oil prices will break the $40 mark before retreating again below $30. Oil prices closed at their highest level since Jan. 5 despite news U.S. crude inventories surged into the stratosphere and raised new concerns about where the nation will be able to store the commodity in the future. According to the U.S. Energy Information Administration, crude inventories increased by more than 10 million barrels last week and pushed storage up to 518 million barrels. Shares of Chevron Corp. (NYSE: CVX) were up 1.2% on the day. Energy optimism popped on news that 15 producer nations are gearing up for a meeting to discuss a possible plan to freeze output levels. According to a statement from Venezuela's Oil Minister Eulogio Del Pino, the 15 nations will discuss an output freeze plan and possible further actions. Venezuela is one of the most oil-rich nations in the world, and it's currently experiencing electricity shortages. Ain't socialism grand? This afternoon, the Fed's Beige Book indicated much broader economic activity across the United States; however, conditions were quite different depending on which region you analyze. Expect a spirited debate among members of the U.S. Federal Reserve during the central bank's policy meeting on March 15-16. Meanwhile, manufacturing activity has largely been flat due to a strong dollar, declining demand from abroad, and winter weather hang ups. Volatile macroeconomic conditions claimed another victim today. Shares of Monsanto Co. (NYSE: MON) cratered 7.8% after the global agricultural giant slashed its full-year outlook. 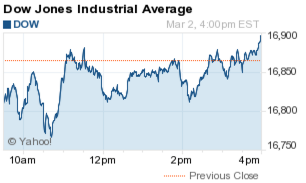 The stock's downturn was the single largest drag on the Dow Jones this afternoon. But the big news today was the death of former Chesapeake Energy Corp. (NYSE: CHK) CEO Aubrey McClendon, who had been charged yesterday by the federal government for allegedly violating antitrust laws. McClendon died in a car crash this afternoon. The news of his indictment had forced prominent Texas private equity giant Energy & Minerals Group (EMG) to "cease any and all new business activities" with McClendon, according to a report from Reuters. The U.S. Justice Department alleged that McClendon rigged the bidding process of oil and gas acreage during his time with Chesapeake and violated the Sherman Act. He was 56 years old. 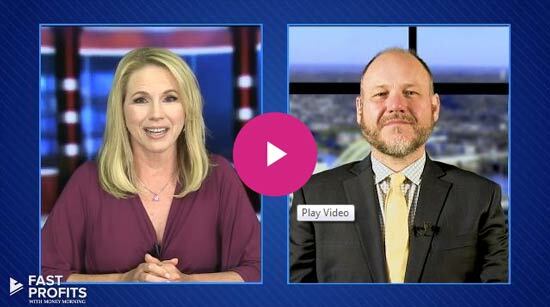 The merger and acquisition activity in the energy sector predicted by Money Morning Global Energy Strategist Dr. Kent Moors is about to really heat up. This afternoon, Exxon Mobil Corp. (NYSE: XOM) CEO Rex Tillerson announced his company is very interested in engaging in a round of acquisitions; however, the executive said many potential targets have set unrealistic price expectations. Exxon will likely wait them out and buy them if oil prices remain low and panic sets in. The firm set the stage for M&A activity by engaging in a $12 billion bond sale last week. XOM stock was up 1.4% today. The burrito bulls are back. Shares of Chipotle Mexican Grill Inc. (NYSE: CMG) rallied another 3.1% today after research firm CLSA hiked its CMG price target from $536 to $613. Sports Authority formally filed for Chapter 11 bankruptcy protection. It's possible the firm shuts down its operations in the next month if it's unable to find a buyer. Pay attention to see if there's any interest from firms like Dicks Sporting Goods Inc. (NYSE: DKS) and Hibbett Sports Inc. (Nasdaq: HIBB). Don't let the door hit you on the way out, shareholders of Zynga Inc. (Nasdaq: ZNGA) said to company founder Mark Pincus. Just a year after returning to the firm to take over as CEO, Pincus is stepping down and will be replaced by board member Frank Gibeau, a former executive at Electronic Arts (Nasdaq: EA). Pincus will still remain the firm's executive chairman of the board. ZNGA shares added 4.2% on the day. Finally, here is your stock pick for Wednesday, March 2. Now, this oil company's brand has been around for almost 100 years and was finally spun off in 2012 from ConocoPhillips (NYSE: COP). Even though oil prices remain down this year, the stock is actually up 6.5%. Now, with M&A activity set to rev up in 2016, Money Morning Chief Investment Strategist Keith Fitz-Gerald thinks this brilliantly run company is a prime takeover target. It's a low-risk energy stock paying a solid 2.66% dividend and holding a very strong balance sheet. Even if the company isn't bought, it's a stock for the long haul. But if this firm is on several companies' radars, expect a bidding war and big gains for shareholders. Read all about the oil stock pick of the week, right here.